While you love your pup, not all aspects of pet ownership are desirable. In fact, some can be downright problematic; and fleas are perhaps the most challenging. These pests are irritating, relentless, and can make you and your pet completely miserable. What’s worse is that all it takes is one flea and you can quickly have an infestation on your hands. Since these pests are such a nuisance, various types of flea medicine for dogs have been invented over the years. But despite best efforts, these pesky critters have figured out how to adapt, rendering many flea control products useless. And while some products may be able to effectively treat fleas, a number of side effects can be occur with prolonged use, and these side effects can cause some pretty serious health conditions. The issues with many flea treatments for dogs highlights the increased need for effective, yet safe, options. After speaking with veterinarians and entomologist, and after conducting extensive research, we’ve compiled a list of the best flea treatment for dogs. Each of these products effectively treat fleas, as well and some treat other pests, like ticks, and they’re safe for your four-legged family member, too! Why Do You Need a Flea Treatment for Dogs? Now that you’ve seen our top picks for the best flea control for dogs, let’s take a closer look at each one. Below, we share a more in-depth look at each product and share our insights so that you can decide which option is the best for you and your pooch. Once you make your decision, click on the buttons to find the best prices on Chewy and Amazon. First up on our list of the best flea treatments for dogs is Bayer Advantage II Topical Flea Treatment for Dogs. It’s one of the top flea treatments that are recommended by vests. This product is designed to combat fleas at multiple stages of life; one of the ingredients kills adult fleas, and another kills eggs and larvae, preventing them from developing. Since one adult flea can lay up to 50 eggs a day (you read that right! ), if one flea lands on your dog, you can have a huge problem on your hands, and quickly. 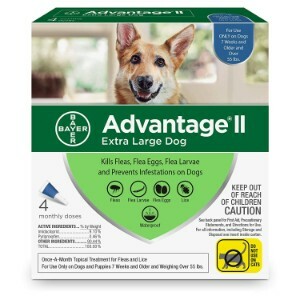 With Advantage II Flea Prevention for Dogs by Bayer, that one single flea will be killed before it can reproduce; and it if does reproduce, this product will stop immature fleas dead in their tracks. This product is designed to kill on contact; the fleas don’t have to bite your pup, but rather, they will die as soon as they make contact with his skin. In addition to treating fleas, this product also treats, prevents, and controls lice infestations. To use it, simply apply the flea treatment onto your dog’s back, between his shoulder blades, and it will start working within 12 hours and keep working for 30 days. The formula is odorless and it’s available in varying sizes. So, whether you have a small breed, like a Yorkie or a Bichon Frises, a medium sized breed, like a West Highland White Terrier or a Cocker Spaniel, or a large breed dog, such as a St Bernard or a Mastiff, there’s a Bayer Advantage II Topical Flea Treatment for Dogs that will work for you. It’s also waterproof, so you don’t have to worry about reapplying it after your dog goes for a swim or after you give him a bath with a high-quality dog shampoo. Conclusion: Whether you want to prevent fleas in the first place, or your dog already has fleas, if you want a product that will offer fast, effective, and long lasting results, than Bayer Advantage II Topical Flea Treatment for Dogs is an excellent option to consider. For more than 20 years, veterinarians and pet owners have been using Frontline Plus for Dogs to effectively prevent, treat, and control fleas. This product is designed to break the life cycle of fleas, as well as ticks and lice. It kills adults, eggs, and larvae, which means that this product will stop pest infestations that already exist and prevent the development of future infestations, too. Frontline Plus for Dogs is waterproof, so if your pup likes to swim, or if he enjoys stomping around in puddles (while wearing his oh-so cute dog raincoat), you don’t have to worry that his flea and tick treatment will wash off. This flea and tick treatment for dogs is easy to use; simply apply it to your dog’s back between his shoulder blades and it will start working almost immediately. Frontline’s formula penetrates into your dog’s oil glands, offering powerful protection against pests for a full 30 days. This product is safe to use on dogs that are 8 weeks of age and older. 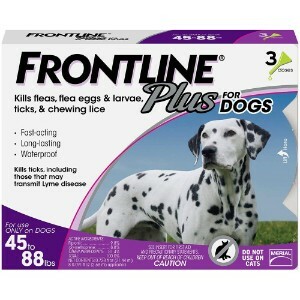 Conclusion: If your pup already has fleas and ticks, than Frontline is an effective product for eradicating the problem and preventing the development of new infestations; however, it should be noted that it does not repel pests, it only kills pests that are already on your pet. If you’re looking for a fast and effective flea treatment for dogs that won’t break the budget, than PetArmor Plus for Dogs Flea and Tick Squeeze-On is a great option to consider. This product may be inexpensive, but that doesn’t mean that it is ineffective. In fact, it uses the same active ingredients that most of the other more expensive flea and tick control treatments for dogs use. And, it starts working within 24 hours after it is applied and provides the same long lasting coverage that other products offer (30 days). 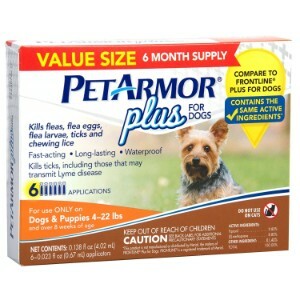 PetArmor Plus Flea and Tick Topical Prevention kills fleas during all stages of their life cycle, including adults, eggs, and larvae. It also kills lice and several tick species, including dog ticks, brown ticks, lone star ticks, and deer ticks; the ticks that are most likely to cause serious health risks, like Lyme disease. To use this product, simply apply it between your furry friend’s shoulder blades. Once it works into his skin, it will start killing off those pesky critters that are driving your dog – and you – insane! The waterproof formula is great, because you don’t have to worry that it will wash off while you’re giving your pup a bath, or when he’s playing around in the water with interactive dog toys. Conclusion: Overall, PetArmor Plus for Dogs Flea and Tick Squeeze-On is affordable and extremely effective. While some owners have said that is has caused reactions, we assume that is because of improper use, or that it was used in conjunction with other flea treatments, such as a flea collar, which you are not supposed to do. If the idea of applying a topical flea treatment onto your dog is something that you aren’t too keen on, then you might want to consider using Novartis Capstar Flea Tablets for Dogs. Unlike many other flea treatments for dogs, which are topical, Capstar is an oral treatment. There’s no need to worry about trying to hold your pet down to apply the product (which is especially beneficial for dog’s that can be a bit squirmy), and you won’t have to avoid touching him until the formula works in, like you have to with topical solutions. Instead, all your pet has to do is eat the tablet, which you can easily get him to do by hiding it in his dog food or in a dog treat (just make sure that you check your dog’s food when he’s done eating to ensure that he did, in fact, swallow the pill). 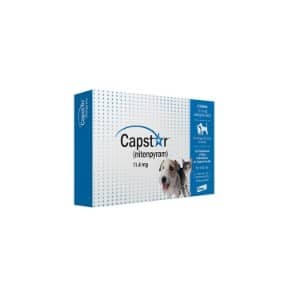 Capstar tablets are designed to kill adult fleas, and it works quickly; in fact, many people claim that it starts working within just a few hours after their dogs have taken the pill. And it’s safe, too; if your pooch ends up getting another infestation of fleas, or if you aren’t sure if he swallowed it, you can give him another tablet. It’s safe for your pup to take on tablet a day. Conclusion: If your pet is suffering from a major infestation of fleas, than Capstar Flea Tablets for Dogs by Novartis can be an extremely effective treatment. This product works fast and while it only kills adult fleas, it is safe to use in conjunction with other flea treatments. For example, you can give your dog a flea bath and brush him out with a quality dog brush to remove eggs and larvae. 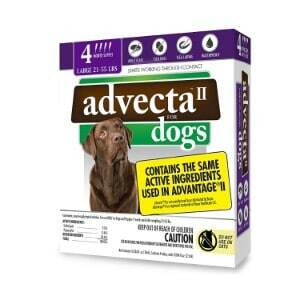 Last up on our list of the best flea treatments for dogs is Advecta II Flea Treatment. This product is specially formulated to effectively break the life cycle of fleas. In other words, it is made to kill fleas during all stages of their life cycle, including eggs, larvae, and adults. It contains the same active ingredients as other products on our list, but it’s sold for a fraction of the price, which makes it an attractive option for pet owners who want to find an effective flea treatment for dogs but don’t want to spend a lot of money. This flea treatment is topical. In order to use it, simply spread the hair between your dog’s shoulder blades apart and apply the solution to his skin. Once applied, the formula will use the oil that your dog’s skin naturally produces to disperse the product throughout, and it will start working within 12 hours after application. What’s more, it works for a long time! In fact, it can prevent infestations of fleas for up to 4 months! And, in addition to killing fleas, this product also treats, prevents, and controls chewing lice. The waterproof formula is ideal for dog’s that enjoy swimming. But even if your pup doesn’t like the water, this product is still a great choice because you will be able to bathe your pooch without having to worry about the formula washing off. It’s also fragrance-free; there’s no stinky odor to deal with. Conclusion: If you’re looking for an affordable flea treatment for your dog that’s easy to use, fast-acting, and offers long lasting results, than Advecta II Flea Treatment for Dogs is an option worth considering. While some users did say that it wasn’t as effective as other products, the vets we spoke with said that it was likely because they applied the product incorrectly. As a pet parent, you want the best for your pup. You’ve selected the best dog bed, the highest quality dog crate, and a dog house that features all of the bells and whistles. If you have a puppy, you may have even have a dog playpen for your pooch so that he can enjoy playing outside without getting into trouble, and if you’re pet is going to be spending a lot of time outside, you might even have an outdoor dog kennel for him so that he has plenty of space so that he can run safely. Since you put so much thought and care into finding the best quality products for your furry friend, it stands to reason that you are also going to want to put the same thought and care into selecting the best flea treatment for dogs, when and if your pooch comes down with an infestation of fleas. Just like every other type of dog product out there, there are tons of flea treatments for dogs on the market. With so many choices, it can be hard to pick the best product. In order to help you narrow down your choices, we’ve developed a buyer’s guide that’s full of valuable information. Keep on reading to find out more about the top rated flea treatments for dogs. Fleas are more than just a nuisance; they can be downright dangerous. These pests can cause painful bites that can cause your dog to actually chew or scratch off his coat and create sores his skin. They can also carry diseases that can cause a number of health issues, such as flea bite dermatitis, typhus, and tapeworm, and even the plague! To combat a flea problem, you need to act quickly. Adult fleas can lay up to 50 eggs in a single day. All it takes is a single flea to cause a major infestation; not only on your pet, but throughout your entire house! By using a high-quality, fast acting flea treatment for dogs, you can nip this problem in the bud so you and your four legged family member can get back to a fun, peaceful, and flea-free life. Easy application. The best flea medicine for dogs will be easy to apply. Your dog is already going through enough with a flea infestation; the last thing he needs is the added stress of a difficult application of a flea treatment. Topical solutions and tablets that are taken orally are the easiest options available. They can be administered within a matter of seconds, and your dog won’t have to be restrained. Fast acting. The best flea treatment will also be fast acting; the faster it works, the faster your dog will get relief, and the sooner the problem will be under control. Most of the top rated flea treatments for dogs start working within 24 hours of application; though many start working within just a few hours. Long lasting. The treatment should also offer long lasting coverage. It won’t be very effective if it stops working in just a few days! Lasting, the best flea treatments for dogs are waterproof. You don’t want to worry about your dog’s treatment washing off in the bath, when he’s swimming, or when he’s outside in the rain. Treats other pests, too. In addition to treating fleas, high quality flea and tick treatments for dogs will also combat other pests, like ticks and lice. There is nothing worse than discovering that your furry friend has been infested by fleas. Fortunately, you can combat the problem by using the best flea treatment for dogs. In this guide, we offer five of the best options that are currently on the market, and also provide information that will help you make the best choice for your pooch. By using the best flea and tick treatment for dogs, you can treat your dog’s pest woes promptly and prevent the problem from growing into a major catastrophe. If you aren’t sure which treatment you should use, speak to your vet. He or she will be able to provide you with more detailed information so that you can make the best decision for you and your pet.